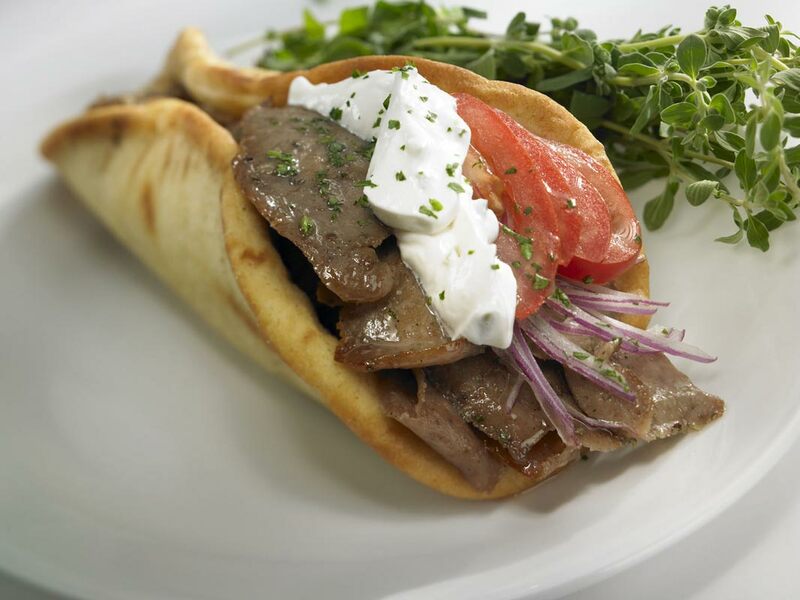 A gyro is a dish of meat roasted on a vertical spit. It is usually served as a sandwich, also called a gyros, with tomato, onion, and tzatziki sauce, wrapped in pita bread. To make gyros, pieces of meat are placed on a tall vertical spit, which turns in front of a source of heat, usually an electric broiler. If the meat is not fatty enough, strips of fat are added so that the roasting meat remains always moist and crisp. The rate of roasting can be adjusted by varying the strength of the heat and the distance between the heat and the meat, allowing the cook to adjust to varying rates of consumption.